Lightweight Frankie Gavin became England's first ever World Amateur Champion with victory over Domenico Valentino in Chicago on Saturday. Gavin, 22, controlled the contest from the start, beating the Italian 18-10. "It is the best feeling ever to be world champion," he said afterwards. "I've fought six bouts and my tactics have been spot-on each time." The win sealed an impressive tournament for England, with Bradley Saunders and Joe Murray earning bronzes this week. Those who missed out still have two more chances at Olympic qualifying tournaments early next year. 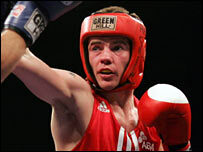 All three boxers qualify for the 2008 Beijing Olympics, while Tony Jeffries became England's fourth qualifier when he reached the quarter-finals in the light-heavyweight division. However, Birmingham's Commonwealth gold medallist Gavin will quickly have to get used to being regarded as the Olympic favourite for his division - an accolade head coach Terry Edwards firmly believes he deserves. How will British boxers fare in Beijing? "Frankie is England and Great Britain's first world champion," said Edwards. "He came through the system and proved his class in the toughest competition in boxing. Six wins against the world's best says it all."